Family vacations can be a lot of fun. Your family gets to spend time together. A lot of time together, and your toddler loves this. Time away means more hours with you and much fewer good-byes. It also means more relaxing time, for everyone. Your toddler astutely picks up on your emotions, so when you’re chillin’ out, they are as well. It’s no wonder, then, that returning home from vacation and back to the normal day-to-day routine requires some adjustment. Like many events in your little one’s life, shifting from vacation mode back to home life isn’t automatic. Think of this as another transition for your toddler. They need some time, and your patience, to make the switch. In my last post, Traveling with Toddlers Part 2, I shared my tips for enjoying your time away, and today I’ll give you my best advice for making the transition back home. WHAT YOU CAN DO TODAY: Make the transition easy, and not abrupt. Return Early. Based on my experience and after talking to other parents, grand-parents and caregivers of toddlers like you, I recommend returning home a day or two before you return to “normalcy” giving all of you time to adjust. That’s not always possible, I understand, but if you can swing it, a couple of readjustment days where you and your toddler can ease back into the normal routines will make a big difference. Less melt-downs and disagreements, from them. More head space (i.e. sanity) for you. Receive My Free Toddler Tips! Play at Home. Plan a fun activity or outing soon after you return home. This way, your toddler does not feel that vacation is the only place for fun. Home can be fun, too, and that will help ease your child back into day-to-day routines. Consider visiting one of his or her favorite parks, introducing a new toy for water play at home, or preparing a fun meal together, such as dinner-for-breakfast (this was a big hit in my home when I was a kid!). Make Time Adjustments. If you’ve returned from another time zone and had to move your clocks back or ahead, give your little one time to reset. This can take several nights depending on the hours of time difference between where you were and where you are now. Day by day, move their meals, nap and bedtime back (or ahead) to your standard time. If your child is whinier or having more meltdowns than usual, remind yourself that travel, visiting family, staying in new places and jet lag are exhausting, even if they had the time of their life. Own Your Feelings. On the one hand, you may feel relieved to finally be home (it can be draining to travel with toddlers and young children!). On the other, you may feel sad about leaving behind the special time you had with family and friends, the beautiful setting, or the relaxing pace. Take notice of these feelings and share them with your spouse or a friend for support. Your toddler isn’t the only one who has to make the shift back home. Give yourself time to readjust, too. Reminisce. Sit and talk about your vacation with your child. Look at pictures or a photo book of the trip and instill those happy memories in their mind. Ask them to recall what they did and the special people they visited. Did you dig in the sand at the beach? Visit cousins? Splurge on chocolate chip ice cream? Studies show that talk of past events helps thinking, memory and language development. It helps your toddler transition home, too. And then once your family is readjusted to home life, you can begin to plan your next get-a-way. Remind your kids that there will be more vacations ahead! Don’t forget to read The Secret to a Stress-Free Family Vacation- Part 1 and How to Have a Happy Family Vacation- Part 2 of this series. Are you just back from a trip? I’d love to hear what works for you. 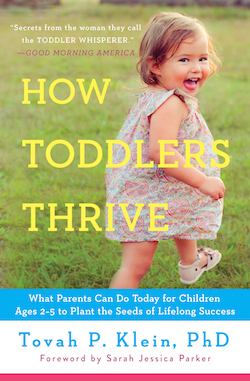 Please share your ideas with me via Facebook (How Toddlers Thrive) or Twitter (@tovahklein). NPR is covering aspects of children’s play this summer. I am quoted on both of these segments from Morning Edition and Weekend Edition.